A proposed redesign of the state flag from Utah County resident Jonathan Martin. Try to picture the Utah state flag without looking at the bottom of this page. It’s navy blue and it has an eagle and that’s probably as far as you got, right? The current state flag leaves a lot to be desired, according to some lawmakers and flag enthusiasts — known formally as vexillologists — who are hoping to overhaul the current design. Two competing bills to do just that were heard on Tuesday by the House Government Operations Committee. Utah County resident Jonathan Martin drew up one of the proposals (pictured above). “In the south, you have the red, representing the red rocks of southern Utah, and in the north, you have the white, representing the snow-capped mountains of Utah,” he told the committee. Martin and his father, Richard Martin, started a grassroots campaign called The Organization for a New Utah Flag to promote their design. 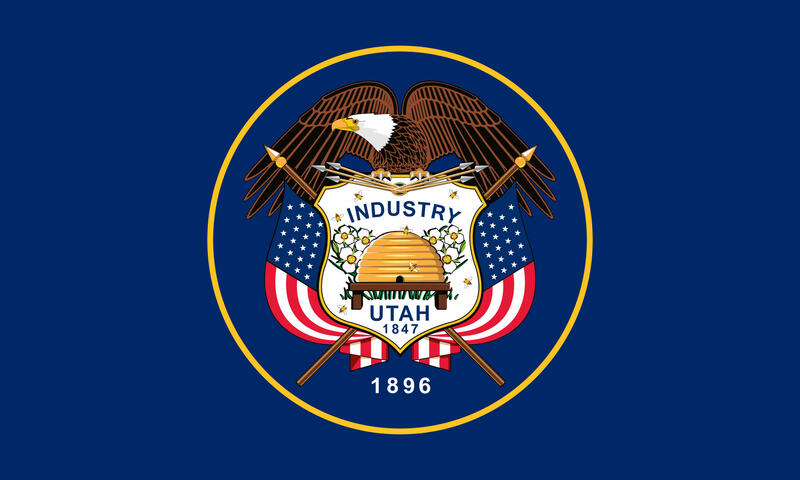 He pointed to the fact that even current flags displayed at the capitol are from a previous, pre-2011 makeover as evidence that Utah could do better. “That right there hammers home the importance of a symbol and a flag and a banner that can represent our statehood for generations to come,” said Martin. Proponents like the Martins say a makeover could give Utahns a symbol to be proud of and help boost tourism. “It feels and looks to me like a really great corporate logo,” said Seegmiller. Others pointed out that the inclusion of 1847, the year Mormon pioneers arrived in Utah, could easily be mistaken for the date Utah was granted statehood in 1896 — and excludes earlier explorers and Native Americans who had already settled the region. A separate bill to form a commission to study the change and propose other designs was received more warmly by committee members.